Anyone who used Dark Mode in the first three betas are fully aware that dynamic wallpaper didn't completely work. It supported Light Mode, but not Dark. Dynamic backgrounds now work in the latest betas, changing their appearance throughout the day based on location. Dynamic desktops have now been split into their own section within the Desktop and Screensaver panel of System Preferences. There is also a new dynamic background, called Solar Gradient. It switches from a bright orange to a deep blue throughout the day and night. Since macOS Mojave contains a new interface for taking screenshots, there was no need for the aging Grab utility. It has been removed in the latest beta and replaced with an "app" called Screenshot that launches the new screen capture hub overlay. We noticed that the RAM allocation issues found in previous betas seem to have been resolved. This has led to an overall speedier experience. Specifically, in the first three betas it could take up to six hours for a longer video to export. After installing beta four, the same video can take maybe 20-30 minutes. A huge improvement. 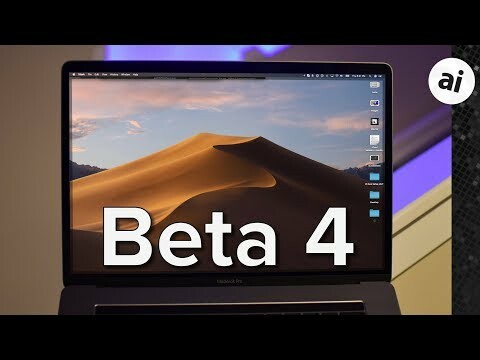 Ready to purchase a new Mojave-ready Mac? Apple authorized reseller Adorama is knocking $50 off every single 2018 MacBook Pro with coupon code APINSIDER. To activate the discount, you must use this shopping link and enter the code during checkout in the same browsing session (look for a link that says "Do you have a gift card or promo code?" next to the gift icon and click that to bring up a coupon code field). How about fixing stuff that doesn't work right? Here is an enhancement suggestion for Apple: set up a webcam in some really classic locations that can be accessed by an expanded version of this dynamic image feature. Eg Times Square, Buckingham palace, Rio, Sydney harbour (most big cities really), maybe also natural places like Ayers Rock, Victoria falls, Niagara, Mt Kilimanjaro, Matterhorn etc. Most features that might be visible to some degree at night would be best I suppose though. Cities would be good as people could have their home town on the desktop and see what it is like right now even though they are on the other side of the world. I presume you mean something along the lines of the RAM issue, or the dynamic background fixes mentioned above. Or the horribly messed up scrolling they had in the News app, but is now fixed. That was probably on account of bugs in the new iOS/MacOS shared API, so would fix multiple apps. Just because AI didn't mention all the changes in the new beta doesn't mean they aren't there. Amazing how many people install beta software without understanding what beta software is.